له خبرة في تطبيق هذا المقياس و معالجته إحصائيا ،على مستوى الوطن العربي و الإسلامي. Part I discusses the Job Content Questionnaire (JCQ), designed to measure scales assessing psychological demands, decision latitude, social support, physical demands, and job insecurity. Part II describes the reliability of the JCQ scales in a cross-national context using 10,288 men and 6,313 women from 6 studies conducted in 4 countries. Substantial similarity in means, standard deviations, and correlations among the scales, and in correlations between scales and demographic variables, is found for both men and women in all studies. Reliability is good for most scales. Results suggest that psychological job characteristics are more similar across national boundaries than across occupations. This article consists of three parts. 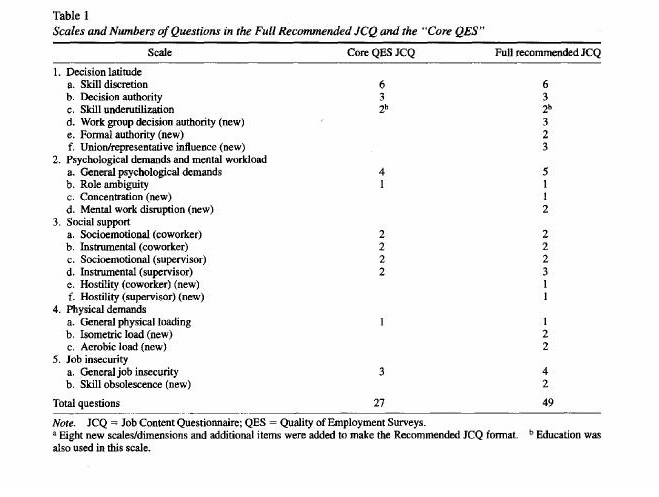 Part I introduces the Job Content Questionnaire (JCQ) as a tool for psychosocial job assessment. First, a description of scales and their underlying theoretical concepts is presented. This is followed by a discussion of empirical issues in the development of the questionnaire and its validity. Part I concludes with a discussion of measurement issues, administrative issues, and future challenges. societies: the United States, Canada, the Netherlands, and Japan. JCQ scale means, standard deviations, reliabilities, and correlations are compared. Part III reviews comparison of the intercountry and interoccupation differences in the scales, discusses specific scales issues, and discusses the implications of the study for interpretation of psychosocial job assessment questionnaires. The JCQ arose out of the adaptive response to serve the new empirically based areas of social epidemiology, behavioral medicine, and psychosocial job analysis, requiring a multidisciplinary theoretical model. Because the primary theoretical model upon which the JCQ is based and discussions of alternative scale formulations in its domain are extensively reviewed elsewhere (de Jonge & Kompier, 1997; Karasek, 1979, 1997; Karasek & Theorell, 1990; Kristensen, 1995, 1996; Landsbergis, SchnaU, Warren, Schwartz, & Pickering, 1994), this article only presents outlines of those arguments by way of an introduction to the JCQ scales. The most commonly used demand/control model hypothesis (Karasek, 1979, 1997; Karasek & Theorell, 1990) predicts that the most adverse reactions of psychological strain occur when the psychological demands are high and the worker's decision latitude is low: job strain. Low social support at work further increases risk. A second set of hypotheses, related to what might be called good stress, involves active behavior development under conditions of high demands and high decision latitude, which predict motivation, new learning behaviors, and coping pattern development (of course, the active behavior hypotheses are contingent on demands not being too high). The reverse is predicted for low demands coupled with low decision latitude: a very unmotivating job setting leading to negative job learning or gradual loss of previously acquired skills. A dynamic version of the model integrates the job strain and active behavior hypotheses with personality characteristics measuring accumulated strain and self-esteem development (Karasek & Theorell, 1990) with the goal of predicting strain development and learning over time. The model is based on measures of psychological demands of work combined with a measure of task control and skill use (decision latitude). The psychological demand dimension relates to "how hard workers work" (mental work load; Meshkati, Hancock, & Rahami, 1990), organization constraints on task completion, and conflicting demands. It includes subscales shown in Table 1 (Subscales 2a, 2b; see Karasek & Theorell, 1990). The "recommended version" includes additional specific measures of cognitive workload (Subscaies 2c, 2d). for workers to make decisions about their work (autonomy; e.g., Hackman & Lawler, 1971). A question on skills required by the job allows assessment of skill underutilization (Subscale lc). A third, macrolevel component of decision latitude assesses the possibility of participatory influence on organization level issues, as well as union and work-group participation (Subscales ld, le, If). The JCQ integrates use of both individual and occupation-based conceptions of job characteristics. The occupation-based job characteristic assessments yield an effective communication tool for interpreting the meaning of the otherwise abstract psychosocial JCQ scales in terms of specific jobs situations, and provide a source of validating information about job situations. As an example: When the two JCQ job characteristic scales---decision latitude and psychological demands--are arrayed as a four-quadrant diagram, they define the strain and active behavior hypotheses of the demand/control model. These can be used to display (see Figure 1) average job characteristics of occupations in U.S. Census occupation codes and the U.S. Quality of Employment Surveys (QES) database (Karasek & Theorell, 1990). In Figure 1, the active job quadrant (upper right) with high demand and high control, has high-prestige occupations: public officials, physicians, engineers, nurses, and managers of all kinds. The passive job quadrant (lower left), with low demands and low control, has clerical workers such as billing clerks, and low-status service personnel such as janitors. 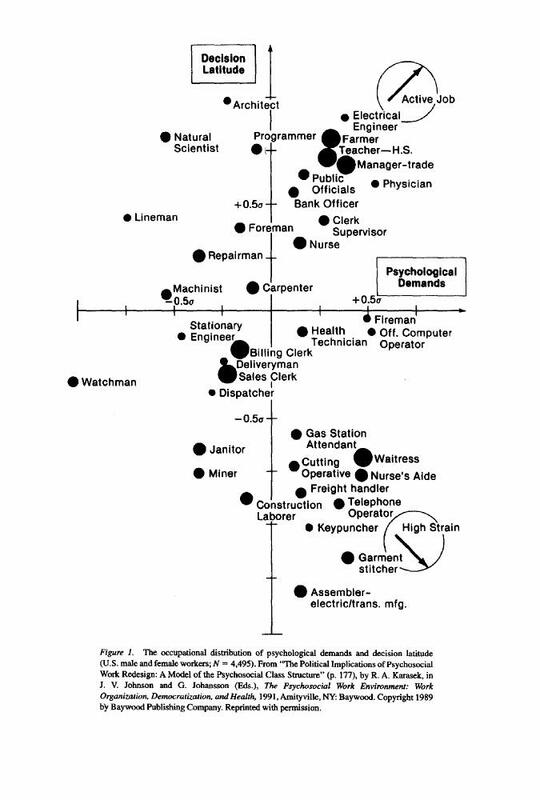 The high-strain quadrant (lower right), with high demands and low control, has machine-paced operatives such as assemblers, cutting operatives, freight handlers, as well as other low-status service operatives such as waiters. Occupations with high percentages of women are frequent (garment stitchers, waitresses, telephone operators, and other nurse's aides). Lowstrain self-paced occupations (upper left) often involve significant training and self-pacing, such as repairmen, linemen, and natural scientists. Kristensen (1996) reconceptualized the four quadrants above respectively as qualified work, surveillance work, tempo work, and craftsman's work. Kristensen identified the linkages to structural and technological developments in production processes, thus making itmore useful in job redesign contexts. The demand/control model has been expanded by Johnson (Johnson, 1986; Johnson & Hall, 1988) with the addition of social support as a third dimension. The primary hypothesis, that jobs which are high in demands, low in control, and also low in social support at work carry the highest risk of illness, has been empirically successful in a number of chronic disease studies (Johnson, 1989; Karasek & Theorell, 1990). Karasek and Theorell (1990), Karasek, Triantis, and Chaudhry (1982), and Johnson and Hall (1988) discussed the differential impacts of support from coworkers and from supervisors and, within these, the separate impacts of instrumental and socioemotional support, respectively (Subscales 3a, 3b, 3c, 3d). Interpersonal hostility is also included as a measure of social support deficit (Subscales 3e, 3f). The social support addition acknowledges the need of any theory of job stress and behavior development to assess social relations at the workplace. The "demanding costs" of work activity are not just mental but also physical. Indeed, the more traditional concept of workloads involves physical loads. Physiological effects of stress on the cardiovascular system, the effectiveness of mental functioning, and general fatigue are shown in much research literature to depend on both mental and physical loads, and thus this measure is also included in the JCQ. Although the original QES questionnaire contains only a single item on physical exertion (Subseale 4a), the recommended form of the JCQ includes static (Subscale 4b) as well as dynamic physical loads (Subscale 4c), both shown to be important for musculoskeletal disorder development.